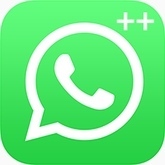 WhatsApp++ is a tweak for your favorite messenger, which brings the most-requested features to WhatsApp! IMPORTANT NOTICE: Do NOT update WhatsApp from AppStore before receiving confirmation from developer. Updated at: Jan. 26, 2019, 11 a.m.